can a ct26 turbo be bolted on a toyota 22re motor? Hey I got a deseil 97 ln106 Hilux (2.8) any chance a ct26 would go alright and safe On it without needing a full rebuilt motor? The Hilux runs a CT20, it has a different turbine outlet (dump pipe flange) and also a single entry turbine housing as opposed to the CT26 that runs a Twin entry, not really worth the upgrade to be honest you would be better going for something larger again. what is the torque for the compressor wheel on a t26 Toyota stock turbo? 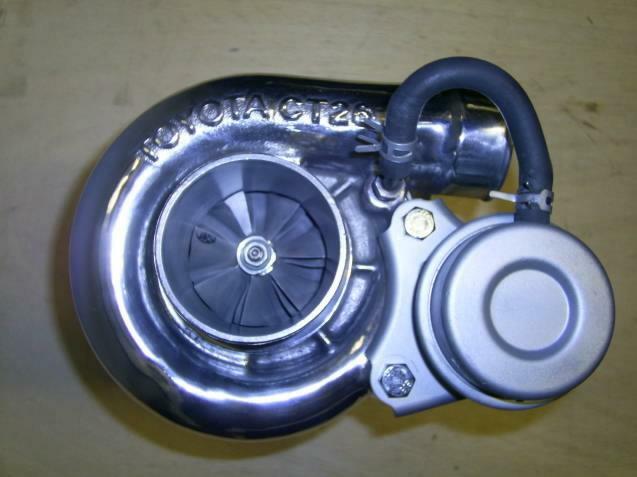 thanks for any info, cant seem to find any REAL specs for this turbo. Hi Terry, the torque specification for the compressor nut is 8-10 ft-lb, however we never use a torque wrench when tightening such small nuts and bolts as they can still easily thread or strip, these torque specifications really only apply to brand new parts, tighten the nut by hand until it is just firm and also use a dab of lock tight and it shouldn’t come undone . Hey thanks admin! Unfortunately went to take the nut off and the shaft stop turning, so tightened it back up, still would not turn, tore turbo off car (#$%#$%^&**!!) and tore it down, (short of the center section) and it’s junk! the Watergate sealing surface has two big cracks in it just like you have mentioned and the bushing was seized to the shaft and spinning inside the housing, (starved for oil I guess) he did get it hot because It was low on coolant but only went a couple block’s, ohh well! it was a used car and that’s what ya get if you dont check it out first! look’s like turbo time! my son has two new turbo’s, so he will adapt his new one to it! Maybe come back for parts etc.. guessing the motor is dusted as well fro inside the rubber intake inter cooler tube just ahead of the turbo is full of oil and dirt! and 4 holes are just above 100 psi and should be up around 140-145, will attempt a valve adjust but guessing it wont help! another yard dart! that makes 4 rigs now! atta boy! So bearing pre-load, torque specs and end play mean nothing to you? remind me not to buy a turbo from you. Terry I am not sure what your problem is, clearly you are not experienced within the area of turbocharger rebuilds and generally it is not a DIY job. You asked a question and I answered, this is the internet, not a paid service, if you are not happy with the answer I have given you then I suggest you take your blown ct26 to a shop and pay a professional to explain everything to you or carry out the work. How much Boost can I safely run on a very well maintained engine with all stock parts in good condition, I have heard horror stories of cars running a little more boost and blowing engines up since MR2 stock inter-cooler is not very efficient. Thanks for this article, great info. Hi Muda, if the motor was completely stock I would not run any more than 10-13 psi. If you upgraded the intercooler to keep the boost cool, exhaust and dump pipe to get the hot air out the turbine you might get away with 15-17psi but it will be the fuel & ignition control that could cause damage, adding more boost is always better with an aftermarket ecu.